"Teapot," 9 inches in height, paper clay on steel hardware cloth. For many people, there is a conflict between the world of high tech and the fine arts; but as an artist living with an engineer in Silicon Valley, I’ve come to realize that we’re all "artists" doing creative work. Investigating this relationship between art and technology is the focus of my "Mathematics as Metaphor" series, for which mathematical shapes—the cube, pyramid, M6bius strip-were chosen as metaphors for modern life. 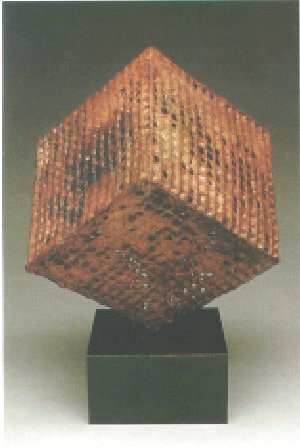 I had first heard of paper clay several years ago, but it wasn’t until I decided to make a series of cubes that appeared to be floating in mid-air that 1 realized by combining these three materials—clay, paper and steel wire—I could make clay cubes light enough to be suspended by nylon line. 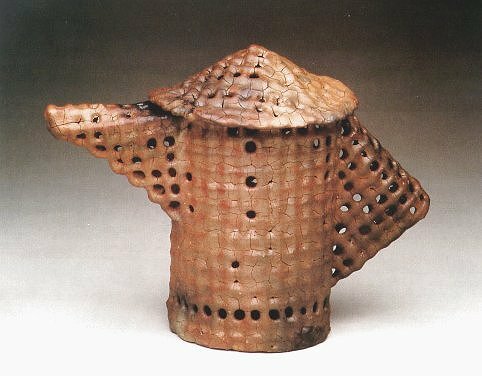 Each material contributes its unique characteristic to produce forms that would be impossible to obtain in any other way. The steel wire defines the form and serves as an armature for the paper clay. After firing, when the steel is weakened, the clay supplies the structural strength. I begin by drafting precise paper patterns of the design. Then, wearing leather gloves, I follow the patterns to cut ½-inch hardware cloth with tin snips. After the seams are joined with wire, many layers of paper-clay slip are poured or brushed onto the hardware cloth armature. Each coat of slip must dry completely before the next can be added. This process can take many days. To prepare the paper clay, I mix dry stoneware or porcelain clay into water until it is the consistency of thick cream. To this, I add paper pulp made from cotton linter (available from most art supply stores). I prefer to use cotton over recycled paper because it lasts longer without smelling rotten. For my sculptures, I find that about 20% pulp to 80% slip by volume is a good blend. Each new coat of paper clay will stick to the previous bone-dry layer; when the fibers burn out in the bisque, there is sufficient clay remaining to support the form. Insufficient clay can be a problem when working with paper clay; it is possible to end up with so little clay that the piece just falls apart. Once the wire is covered with paper clay, the surface can be coated/decorated with slip or underglazes. Because of the firing range of the steel wire, I am limited to coloring techniques that do not go above about 1800°F. For most of my sculpture, I use terra sigillata as a source of color and sheen. To further define and mottle the surfaces, I smoke the bisqued pieces with newspaper in an open washtub. This is often followed with a lightly buffed paste wax or shoe polish. If the piece is to be exposed to weather, I protect it from absorbing water by applying a masonry sealer (available at most hardware stores). Other low-fire techniques, such as raku or low-fired glazes, are also possible when working with paper clay and steel. New materials often demand new techniques and lead to new solutions to old design problems. Using paper clay in combination with hardware cloth has opened up a whole new area of design for me. I am now using the process to fabricate metaphorical vessels and abstract figures.